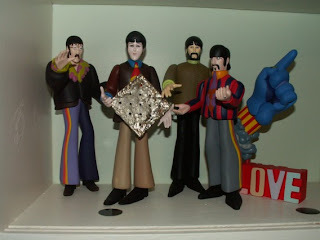 What's not to love about the Fab Four rocking out with a cracker? This collector from St. Louis knows that Sir Paul is not only listed in Guinness World Records as the "most successful musician and composer in popular music history", but he is obviously a HUGE cracker fan. Was the song originally going to be "Lucy in the Sky with Crackers"? Don't know, but we do know that the "The Beatlecracker Suite" must have been an ode to crackers à la Tchaikovsky (you might notice that Tchaikovsky was cute and had pretty long hair - making him a very early Beatle). Too cool sistah girl. All you need is love... and crackers!